“I check in occasionally. This neighborhood wiki is a fun project. 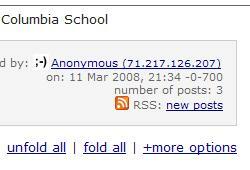 Columbia Citizens contribute to the site by posting comments, creating pages and editing content. How does a Citizen conveniently keep track? and you can opt in for weekly emailed alerts. Experience Columbia Citizens as a "feed"
Have the internet come to you! It's easy to set up a feed reader to view updates. Feeds arrive as bulleted items for easy browsing. If something piques your interest, you can check out its linked content, or you can tag it to read later. Otherwise you can wipe the reader slate clean and move on. Columbia Citizens offers a variety of feeds. You can track one discussion or several. You can get Citizens' Wikli alerts. If you want, you can track each and every site edit. Or you can customize a feed to monitor only certain wiki-pages. It's anonymous and free. It's easy to subscribe or unsubscribe to any feed. You can also use your reader for updates to news sites and interesting blogs. Once you've chosen a feed reader, you can get these Columbia Citizens feeds and more. Just click on the feed link and paste its address into your reader. any new discussion or comment in a selected category. At the top of any discussion, there's a link to its feed (right). Here's a quick video by Mount Baker neighbors Lee and Sachi LeFever. They've spelled out why feeds work well, how they work, and how to get you started.